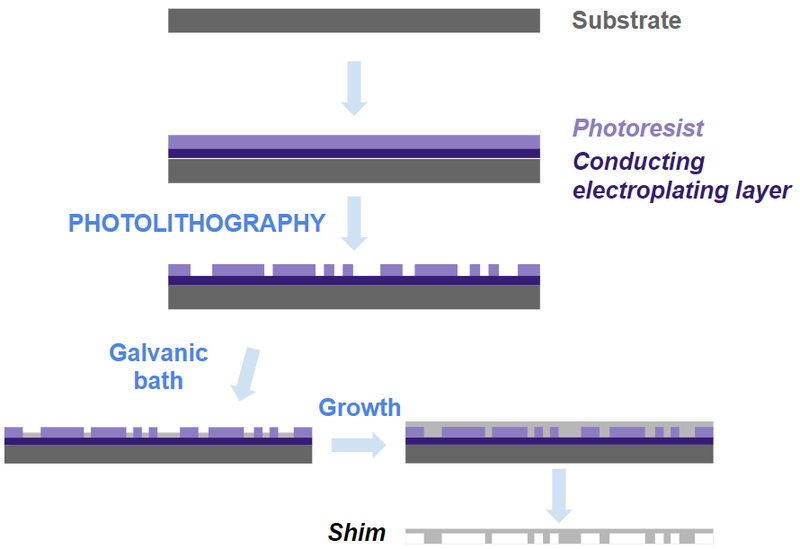 Among indirect microfabrication methods, many have been used in the past for the fabrication of molding tools but not all of them are suitable for microfluidics. Only LIGA process is presented here. Electroplating is still a major method for mold master fabrication, with nickel and its alloys as the metal of choice (e.g. : NiCo, NiFe). 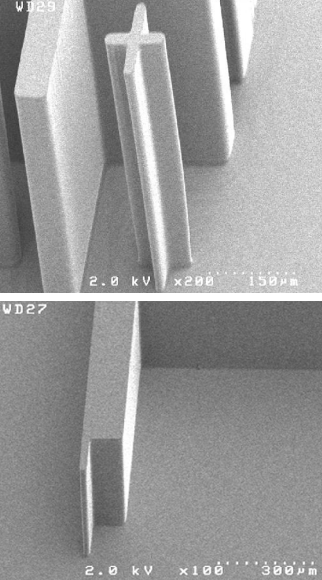 In microfluidic applications, the dimensions are around 125µm pitch structures 25 µm thick. Traditional machine tools can be used to fabricate the masters, but often the surface finish is too rough and pattern complexity makes machining throughput low, though it is a useful method for making a few test devices. Advantages: small surface roughness, resulting nickel tool has a good surface chemistry for most polymers. Drawbacks: slow growth rate of nickel in the electroplating process (10-100µm/h), high stress levels in thick nickel layers, radial dependency of the growth rate (unwanted difference of structures height). LIGA process applied to SU-8 resist. Image source: . LIGA is a German acronym for Lithographie, Galvanoformung, Abformung which means Lithography, Electroforming, and Molding. This technique is originally based on deep X-Ray lithography thanks to a synchrotron irradiation which cures a X-Ray-sensitive resist by passing through a mask partly covered by an absorbing material. This technique allows to only achieve high aspect ratio structures (structure height up to several millimeters and minimum feature sizes in the order of micrometers) with a high precision on a wide variety of materials can be used (metals, plastics, and ceramics). But the process is complex with too many process steps (relatively long processing) and needs a synchrotron facility which is far from a handy and affordable process. An alternative exists: UV-LIGA. It relies on optical lithography of very thick negative resist (SU-8) and the X-Ray source is simply replaced by a UV-light source. It is also a simple way to fabricate multilevel microstructures. This makes the UV-LIGA less complex (short throughput time), much cheaper and more accessible than its X-ray counterpart and can offer attractive high aspect ratio microstructures. However, UV-LIGA is not as precise as X-Ray LIGA and can only provide lower aspect ratio structures. Advantages: small surface roughness (~10nm RMS), X-Ray LIGA: very high aspect ratios achieved, high precision, wide variety of material; UV-LIGA: cheaper, faster and more accessible than X-Ray LIGA. Disadvantages: X-Ray LIGA: complex, only deal with high aspect ratio structures, long processing, needs a synchrotron facility, very expensive; UV-LIGA: not as precise as X-Ray LIGA, lower aspect ratio structures. H. Becker, C. Gärtner, Polymer microfabrication methods for microfluidic analytical applications, 2000, Electrophoresis, 21, 12-26. S. Franssila, Introduction to Microfabrication, Second edition, 2010, Wiley. Lectures from Dr. T. Fetah Kosar of the Center for Nanoscale Systems, Harvard University, 2014.